Obituary – Johnson, Vera (Kinnick) « Perry High School Alumni Association, Inc.
Senior Class Sec-Treas., Peroma ’21, Basketball ’20, Glee Club ’20, H.A.D.E.S. ’21, Normal Training ’21. Mrs. Vera Johnson, 80, 814 Delaware street, died at 6 a.m. Thursday at Perry Memorial hospital where she had been a patient since Jan. 10. Funeral will be at 10 a.m. Saturday at Parker Funeral chapel. Rev. Jon Neuhs, pastor of the First Presbyterian church, will officiate. Burial will be at Sumner cemetery. 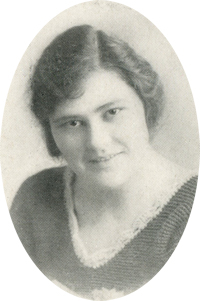 Mrs. Johnson, the daughter of William G. and Maude Kinnick, was born at Perry, Feb. 26,190l. She attended Perry high school and on June 28, 1920, was married at Guthrie to Charles G. Johnson. The Johnsons made their home on a ranch in the Sumner community. After her husband’s death in 1947, Mrs. Johnson moved to Perry. She was a member of the Sumner homemakers group, the Silver and Gold circle of United Presbyterian Women and the First Presbyterian church. Among survivors are a daughter, Mrs. Verona Southern, Spokane, Wash.; a son, Ludwig (Bud) Johnson, who has homes in Perry and Enid; one sister, Mrs. Carol Brock, Glendora, Calif.; a brother, Bill Kinnick, Stillwater; four grandchildren and six great-grandchildren. In addition to her husband, Mrs. Johnson was preceded in death by a daughter, Janice.